Whitehall Products Indoor / Outdoor Clocks and Thermometers combine functional quality with a unique decorative flair that may be used indoors or out. These versatile Whithall Products clocks and thermometers have all weather movements perfect for use indoors yet strong enough to withstand any climate. Each elegant item is crafted of recycled aluminum (a few are resin) then finished with weather resistant paint to last a lifetime. 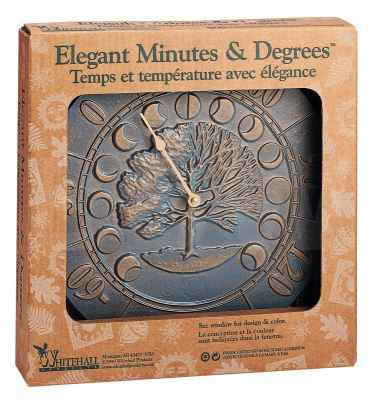 The rust-free durability, upscale finishes and unique designs makes Whitehall Clocks and Thermometers a beautiful home accent. If you are looking for unique and distinctive design that set you apart from the rest, you have come to the right place. Please allow 2 weeks for these special clocks and thermometers. They are worth the wait. These clocks and thermometers are boxed for gift giving as well.